Let's review my criteria for picking a dividend machine and then I will explain why I am adding to Eaton, symbol ETN. This metric seems so simple but companies with externalities outside their control may need to take a charge off against earnings during a given quarter. This is not the case with ETN. With ETN we have a straight forward EPS measure. For ETN, earnings at $7.06 far exceed the dividend pay out which is $2.64. This ratio is often times referred to as payout ratio. A high payout ratio is a doubled edged sword. On one hand you would like a company to pay the stock holders as much as possible. On the other hand, a stock that has a big cushion between EPS and dividend pay out is less likely to cut or suspend the dividend. For conservative investors, this is critical. All the time I helped other people manage their money I emphasized that in 20 years, your non discretionary expenses will double. I have been through this 2 times and I can verify that for this average girl, the projection is accurate and must be included in your financial plan. You can ladder bonds as yield go up or you can put some of your income investments in stocks with solid dividend growth. This post is not to discuss the vagaries of high current dividend versus low dividend yield but high dividend growth. You must have dividend growth to meet your long term income goals. 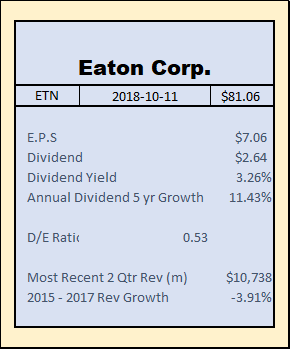 Eaton meets that goal with a 10% dividend increase recently and an average of over 11% increase annually over the past five years. In a previous post I wrote this week, I looked at 5 stocks with a combined average yield above 5%. I looked at around 20 stocks but finding stocks with positive revenue growth was very difficult. ETN describes it's business as "Eaton has approximately 96,000 employees in 59 countries and sells products to customers in more than 175 countries." Eaton suffers from exchange and tariff issues but prevails as an energy generator despite these challenges. Revenues in 2015 were $20,855 (m) and in 2017 $20,040 (m). That is flat to down a bit. However, looking at their two most recent quarters and you see distinct revenue growth over the same two quarters one year ago. The table below presents ETN's Dividend Machine bona fides. 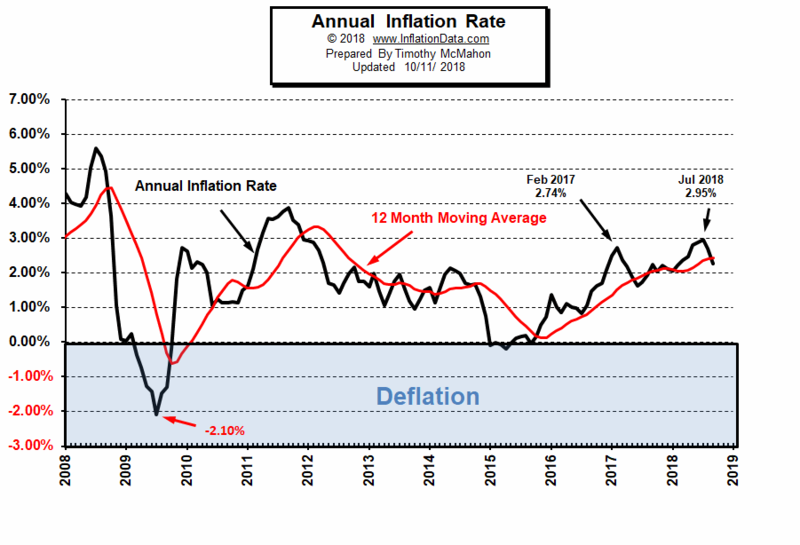 I believe Eaton deserves to be a Dividend Machine. I will add it to my 2018 Model Portfolio that I post in this blog and I will be adding to my current position.